This checklist is provided by the Quincy Fire Department. Please take a look, as it may save your life, or your loved one’s lives. Viral cases of "patient dumping" this year have shown that many homeless patients simply have nowhere to go after a hospital stay. Worth the read. Check it out. This is happening in Quincy too. See the photo essay about James K. Here’s the link to his story. August 2016: Just two days after being released from the hospital for dehydration, James, homeless and sleeping outdoors in Quincy’s downtown district area, is again admitted to the hospital for treatment of pneumonia. Whether homeless, or trapped in Quincy's widespread unlawful substandard housing market, exposed to the dangers of cockroach infestations, black mold, lead paint exposure, and other unhealthy and dangerous conditions, the poor and homeless are caught up in a cycle of health issues unique to their population. There’s often simply no safe or clean environment for them to go to heal. In many instances, PRI programs may be more effective than complaint-based programs in ensuring safe and healthy housing, preserving housing stock, protecting vulnerable tenants, and maintaining neighborhood property values. August 2017: Carson, 3, makes his way down the staircase. The plaster patches and duct tape on the walls of this Quincy rental duplex are the result of Wendy’s daughter’s boyfriend’s attempt to cover several holes that have been there since before the Smith’s moved in. Wendy and Chris say the first landlord said he would make the needed repairs but never did. They say when their current landlord purchased the house more than a year ago he said he would make the repairs to the walls. But a year later, no repairs. By relieving tenants of the burden of having to force reticent landlords to make needed repairs, systematic inspections can help ensure that a locality’s rental housing stock is maintained and that residents live in healthy conditions. Between the establishment of Los Angeles’s Systematic Code Enforcement Program (SCEP) in 1998 and 2005, “more than 90 percent of the city’s multifamily housing stock [was] inspected and more than one and half million habitability violations [were] corrected. The result [was] an estimated $1.3 billion re-investment by owners in the city’s existing housing stock.”For example, between 2008 and 2013, under Sacramento’s Rental Housing Inspection Program, housing and dangerous building cases were reduced by 22 percent. According to a study of PRI programs in five North Carolina cities, the City of Greensboro alone brought more than 8,700 rental properties up to minimum standards in four years under its proactive rental inspection program (RUCO). In addition, by ensuring that landlords are aware of poor conditions before they worsen, systematic code enforcement encourages preventative maintenance, which is more cost effective than deferred maintenance, and thereby helps land lords to maintain their properties. The U.S. Constitution's prohibition against cruel and unusual punishment bars cities from prosecuting the homeless for sleeping outside on public property when they cannot obtain shelter, a federal appeals court ruled on Tuesday. Read the story here. Since The Bail Project launched in 2017, NBC News has had an exclusive, frontline view of how the program is working in cities like Tulsa and St. Louis. by Hannah Rappleye, Brenda Breslauer and Munir Atalla / Sep.02.2018 / 10:57 AM ET / Updated Sep.02.2018 / 11:38 AM ET Check out the story here. This meme lines up with my experience while working on the Quincy IL Poverty Project. Frankly it's worse than this, as poverty reaches into every corner of one's life, creating fear, stress, and anxiety. The effects on children living in poverty are devastating too. Talmadge King Jr., MD, dean of the UCSF School of Medicine, tells the story of an ER physician who had lost a document and was searching frantically for it in the garbage bins behind Zuckerberg San Francisco General Hospital and Trauma Center. What he found instead in the mountain of rubbish were crumpled prescription slips that patients had tossed in hospital trash cans throughout the week. Poverty collides with health every day at UCSF, compelling clinicians and scientists to engineer ways to disentangle the two, one complexity at a time. It’s the nurse trying to help a mom living in a single-room-occupancy hotel find refrigeration for her son’s antibiotic before an infection ruptures his second eardrum. Or the scientist gathering data on the toxic effects of stress on unborn children. Or the dentist trying to salvage the graying teeth in a toddler’s mouth – poverty’s most obvious portal. In 2015, the top 1 percent of families in the United States made more than 25 times what families in the bottom 99 percent did, according to a paper from the Economic Policy Institute. This trend, which has picked up post Great Recession, is a reversal of what was seen during and after the Great Depression, where the gap between rich and poor narrowed. “Rising inequality affects virtually every part of the country, not just large urban areas or financial centers,” said co-author Estelle Sommeiller. “A few months ago I got a speeding ticket while driving through a southern state. (I’ll just leave it at that for now.) I was definitely speeding, so the stop didn’t bother me. Neither did the specific fine for speeding — $62. What I found appalling were the add-ons. There was a court fee, a processing fee, some sort of vague “assessment,” and a few others charges I don’t recall. In the end, the ticket cost me over $250. The extras amounted to several times the cost of the initial infraction. I hadn’t had a speeding ticket in over five years. But the last time I got one, I was only asked to pay the cost of the fine for the infraction itself. So this is a new thing. A yearlong NPR investigation found that the costs of the criminal justice system in the United States are paid increasingly by the defendants and offenders. It’s a practice that causes the poor to face harsher treatment than others who commit identical crimes and can afford to pay. Some judges and politicians fear the trend has gone too far. Project HOME is a Philadelphia non-profit organization empowering individuals to break the cycle of poverty and homelessness through affordable housing, employment, health care, and education. The Jon Bon Jovi Soul Foundation has helped provide support for over 600 units of affordable and supportive housing in 10 states for thousands of people including youth and veterans. The Soul Foundation’s expanded mission helps those in need of a warm, nutritious meal and now operates two JBJ Soul Kitchens in New Jersey. "The myth that poor people shouldn’t, and can’t, have “nice things” – and that having those things invalidates their experiences – is all around us. It’s deeply ingrained in us that there are only two very polarized ways to exist: to be comfortable or to have absolutely nothing. Having anything deemed a “luxury” disqualifies you from talking about poverty, or relying on social support, or asking for help – even if those so-called “luxuries” are necessities like kitchen appliances for making and preserving and storing food, mobile technologies that enable us to stay afloat in the modern world, and apparel that about our situation. The longer we force people to suffer as much as possible before we help them, the worse off we all are. 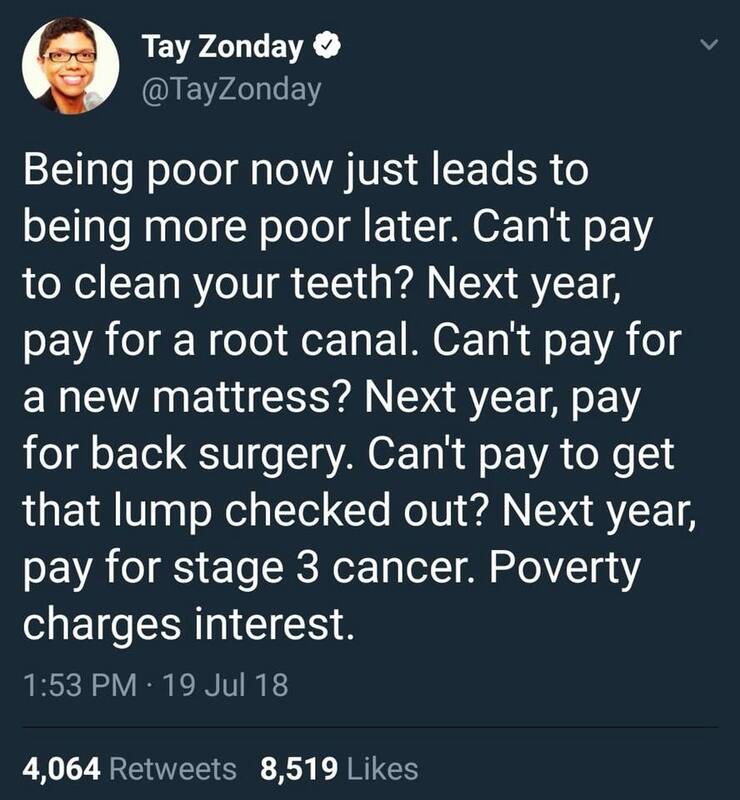 And the longer we sit around pretending poverty only looks like one set of circumstances, the harder it’s going to be to really get down to business and end it once and for all. When we deny things of poor people based in the idea that poor people “don’t deserve” those things, just by virtue of their financial situation, we’re perpetuating classism. Our income, our savings, our credit lines – those are not sums of our worth. When we refuse to empathize and trust in people’s stories, when we refuse to allow the poor to ask for help or call themselves as such, we perpetuate a status quo that makes the actual suffering of poor people invisible and worthless. And when we do that, we hurt everyone who isn’t swimming in pools full of hundred dollar bills. When we tell poor people they can’t be poor and own a cell phone, we invalidate the stories of thousands of low- and middle-class Americans who feel insecure about their finances. When we tell poor people they shouldn’t be buying healthy food, or nice clothes, or renting their own apartments, or anything along those lines, we buy into a false dichotomy between rich and poor that does nothing but make most of us poorer."